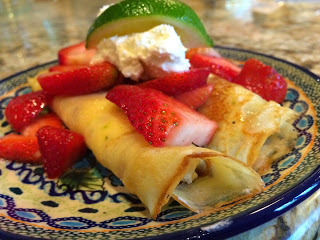 This is a delicious crepe recipe that I serve to my guests at our Cascade Bed and Breakfast Inn. It also makes a great dessert and brunch recipe. You can make the crepes and filling ahead of time, then fill and top with slices strawberries when ready to serve for a time saver. Enjoy! Pour all ingredients except additional butter into a blender and blend until smooth. Refrigerate at least an hour, or overnight. bottom is lightly browned and the batter is set. Using an offset spatula, flip the crepe and cook on the other side until lightly browned about 10-20 more seconds. Beat whipping cream with electric mixer on high speed until stiff; set aside. Beat cream cheese, sugar, lime peel and lime juice on high speed until fluffy. Refrigerate until ready to fill crepes. Toss strawberries in sugar at least an hour prior to serving to allow them to macerate and form a syrup. Spread a heaping tablespoon of filling in a straight line in middle of crepe and roll up. Continue until you have filled all the crepes. Pour strawberries on top of crepes. If you have any leftover filling dollop it on top. Garnish with lime slices. This entry was posted in Uncategorized and tagged Breakfast Recipes, Dessert Recipes, Fruit Recipes by Debbie Reynolds. Bookmark the permalink.